This is the next seasonal round-up of web design articles and posts written by the design community and retweeted on @htmlcut during the winter 2011-2012. This time among the most interesting sections are “Usability and User Experience”, “Forms”, “E-Commerce”, “Mobile Websites and Responsive Web Design”, “Trends” and “Opinions”. Frankly, all sections are instructive and informative and include lots of useful examples, guides and tips, so we strongly recommend to look through all of them. We’ll be glad if this round-up is helpful to you :). 6). Minimalist Web Design: How Minimal is Too Minimal? 1). What is Web Accessibility? 6). Fake Reviews, a Despicable Practice? 1). Should We Always Deploy Content Management Systems? 2). Good Old Static HTML Sites Aren’t Dead Yet. Should They Be? 4). Responsive Web Design: Standard or Feature? 10). Is Responsive Web Design Working? Showcase of 30 Sites That Prove it Does! 7). Understanding Domain Names: Why and When? 3). 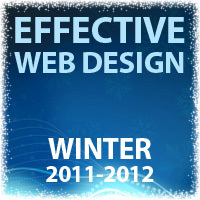 A winter of discontent in the web design world? 9). Mobile Content Strategy: Is Less Always More? 11). What’s All The Fuss About Vendor Prefixes? 12). One-Page Web Designs: The New Poster? Check out also the great articles about Effective web design and its examples in “Related articles” (see links below). this is effective web design for all website. This blog would be very much helpful to those who have stepped in the web designing field.A well explained information on effective web design.